Is "sprayable" paint still necessary? These days, most paint sprayers are powerful enough to spray most wall paints flawlessly without you needing to dilute the paint used. In our opinion, it no longer matters whether that a paint is "sprayable" without dilution. To meet our customers' demands, we tested many different wall paints. The wall paint supplied by Global Paint delivers great coverage. This excellent results for Global Paint, combined with its handy jerry can packaging, convinced us to stock this paint and be in a position to offer advice on this product. Is one application sufficient for proper coverage? We cannot give definitive answers when it comes to paint’ coverage. After all, this has to do with the current colour of the wall surface, or whether a wall has been sanded or primed. However, we can say that if the wall surface is lightly coloured and well-prepared, one coat of paint is generally enough. If the wall is plastered, sand the wall lightly and apply a primer. You can apply the primer with a paint sprayer as well. For spraying ceilings and walls. First spray the walls, and then the ceiling. This will make masking easier. A paint sprayer is very fast and gives a great result, but masking is necessary! Always hold the spray nozzle at a distance of 20 cm perpendicular to the wall. Work in strips from top to bottom and then from left to right if necessary. For ceilings, a handle extension is a valuable asset, even if you can reach it yourself. Creating a little more distance between your eyes and the ceiling means you can get a better look at the paint layers you are applying, especially if you are painting a light-coloured paint onto a light primer. 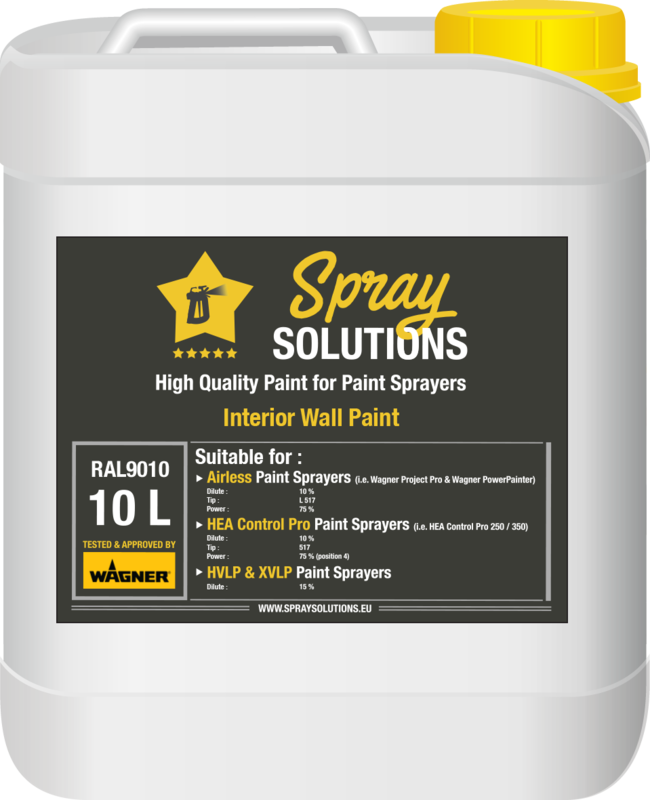 The paint has been extensively tested with each paint sprayer we stock so we can provide the best advice for each machine. W 665 - 20% dilution. W 867 - 15% dilution. W 995 - 15% dilution. Project 115 - 15% dilution; Paint sprayers with 515 (M) tip must be turned onto full power. ProjectPro 117 and Power Painter 60 paint sprayer with 517 tip: 15% dilution. Power at 90%. ProjectPro 119 and Power Painter 90 paint sprayer with 517 tip: 15% dilution. Power at 80%.